Luksusowa Vodka (pronounced LOOK-SOO-SO-VAH) was created in 1928 in Poland. Luksusowa means ‘Luxurious’ in Polish. Triple distilled from potatoes, filtered through charcoal for purity and then blended with pure Artesian well water. Potatoes deliver richer, denser, and smoother vodka than those more traditionally distilled from grain or grapes. Boasts more than 80 years history of premium quality production. Luksusowa is 100% Gluten Free. Delightfully versatile – Luksusowa is a superb mixer. 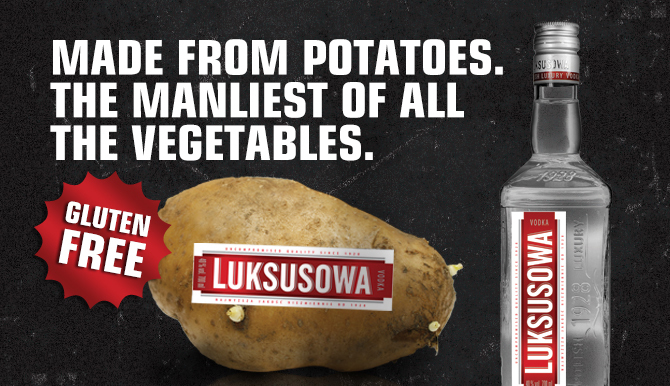 Luksusowa is the Number 1 Selling Potato Vodka in the world. According to Impact Magazine, Luksusowa is the second fastest growing spirits brand in the world. A smooth, rich, high-quality imported vodka that beats the competition in terms of flavor, mouthfeel & price.